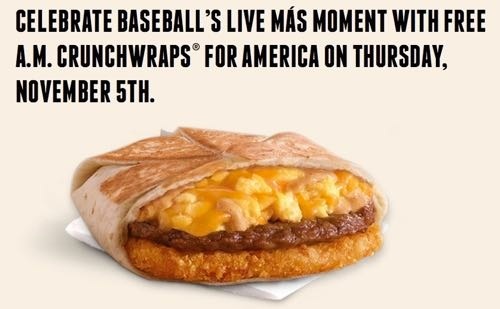 We mentioned previously how Taco Bell would be giving out free A.M. Crunchwraps if someone stole a base during the World Series of Baseball. Well, that happened in the first game with Lorenzo Cain stealing a base in Game 1. 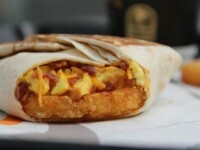 Because of this, tomorrow November 5th, between 7 and 11 AM, you can get a free A.M. Crunchwrap. 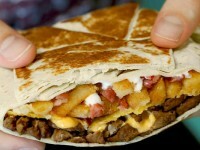 A.M. Crunchwraps are delicious, with a grilled flour tortilla wrapped around egg, your choice of sausage, bacon, or steak, and a giant hash brown. 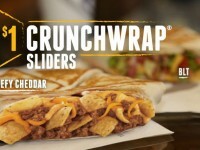 Stop in for a free Crunchwrap.